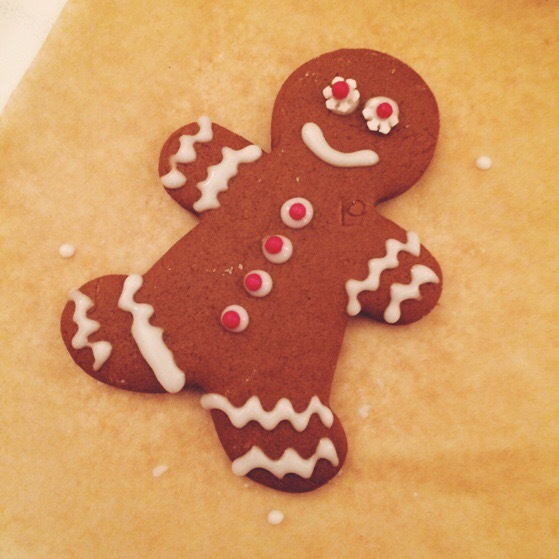 I know you can make gingerbread at any time of the year, but for some reason I only make them at Christmas. 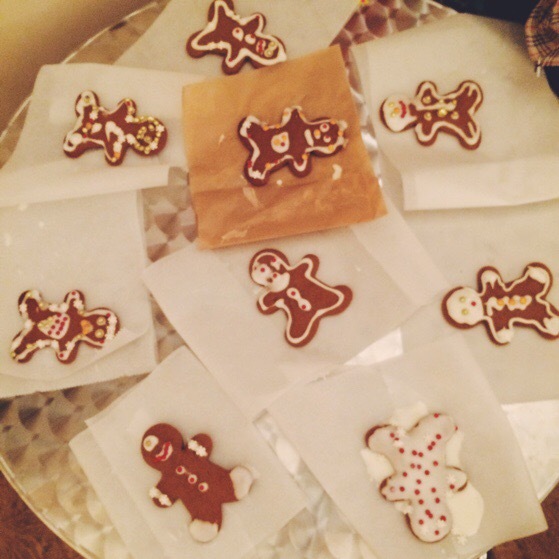 Christmas and Gingerbread Men just go together, like Easter + Bunnies. Ice Cream + Summer. I love the way gingerbread makes your house smell like Christmastime. I’ve used Martha Stewart’s gingerbread recipe for about twenty years now, and I have yet to taste one I like better. Also, it rolls out well and holds its shape when using cookie cutters, so that’s helpful. This year, I had to adjust the recipe a bit to make it with British ingredients. Treacle instead of molasses. Some folks say the two are interchangeable, but after experimenting a bit, I’m not entirely sure. I ended up with a combination of dark treacle and golden syrup to get the taste that I usually get from molasses back home. Also, while making these little fellas, I may have whined about eleventy-million times about the fact that Tiny Oven can only bake three at a time, which basically means it took me the better part of four days to bake a double batch of this recipe. 85 grams unsalted butter at room temp. In a small bowl, mix flour, ginger, nutmeg, bicarbonate of soda, baking powder, and salt. In a large bowl beat butter and brown sugar until light. Beat in egg, black treacle and golden syrup. Slowly add flour mixture until just combined. Flatten dough into two circles, wrap each in parchment paper and chill for for an hour. Roll out each disk on a floured surface and cut out shapes with cookie cutters. Re-roll scraps to make more gingerbread men. Bake for 8-12 minutes, depending on desired softness at 180 degrees C or Gas Mark 4. Allow cookies to cool completely before decorating. Icing: Whisk together water and egg white powder. Add cream of tartar and icing sugar. Transfer icing to a pastry bag with a small tip or a plastic tip with a small hole snipped in the corner. Decorate cookies as desired. I love the fact that you are such a traditionalist with your gingerbread men:) I’ve had ‘Run, fun as fast as you can” going through my mind all morning since reading your post. I also love that your recipe mixes in metric measures as well:) Maybe it’s time you got back to Arkansas. We need an Alison fix! Merry Christmas friend.